Charles Leclerc looked set for his first ever victory in Formula One until an technical issue brought an end to that hope 10 laps from the end. He still limped to 3rd, completing the podium along the Mercedes drivers. Vettel immediately took control of the race as soon as the lights went out, shooting into the lead as Leclerc got a difficult getaway from the starting line. The Monegasque rapidly lost another position through Turn 3 to Bottas, but then managed to fight off Hamilton while Verstappen on his behalf tried to get past Hamilton as he failed to make it past the Ferrari. That didn't work out, on when the cars completed the first lap, Leclerc overtook Bottas again to move up into second place. Bottas's bad exit out of Turn 2 then allowed Hamilton to get into third as well. Further back, Stroll and Grosjean pitted and changed to medium tyres at the end of the first lap already. The two had come together on the exit of Turn 2. On lap 3, Sainz attempted to get past Verstappen, but then got into contact with the Red Bull, creating a front right puncture.Sainz pitted and changed to medium tyres, rejoining the race at the very back of the pack. Having commented on Verstappen on the team's radio "I cannot believe this guy", the Spaniard went on to set the fastest lap on lap 7, 1.2s faster than anybody else at the time. By lap 5, Leclerc had closed the gap to Vettel, and the next lap, he breezed past the German on the main straight, not least thanks to the enlarged DRS effect the came with this year's regulation changes. Meanwhile, in the midfield, lots of close battling enjoyed the crowd. Lando Norris enjoyed himself by battling his way back up, passing Gasly and Magnussen after a troubled start. As drivers started to pit on lap 9, mostly in the midfield, Hamilton had closed the initial deficit he had to the Ferrari's, consistently staying within 1.5s of Vettel. Neither of the front runners however were free of mistakes, with all of them repeatedly seen locking up front tyres and subsequently going wide out of corners. On lap 11, just as Hamilton had come within DRS range of Vettel, Verstappen pitted, becoming the first of the top 5 to do so. He switched to medium while his team mate Gasly had switched to a new set of softs two laps earlier. One lap later, Bottas pitted too, taking on a new set of softs. 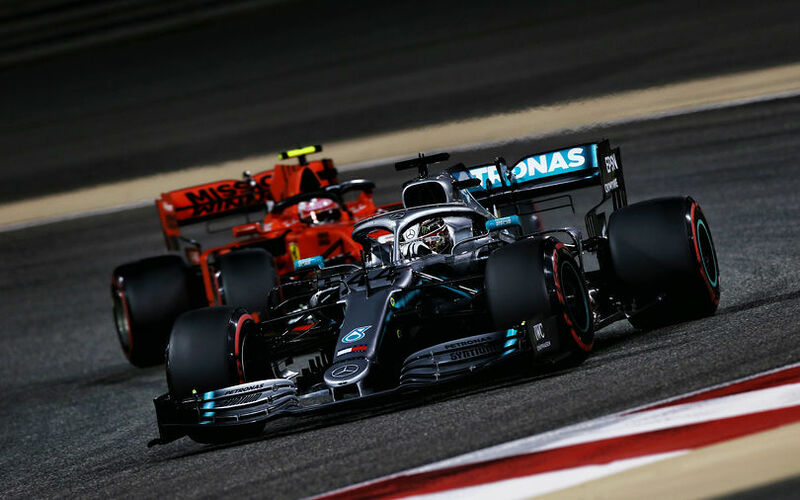 Bottas returned to the track just behind Verstappen as the Dutchman had made optimal use of his brand new tyres to edge ahead of the Mercedes. It didn't last long though, as Bottas made a pass stick through Turn 3. Another lap later, Hamilton and Leclerc pitted, promoting Vettel into P1 and Ricciardo into P2. Vettel pitted the next lap and rejoined behind Hamilton. On lap 16, Ricciardo was the only driver who hadn't pitted yet, but his apparent aim to go for a single stopper cost him pace, resulting in laps that were 4s slower than the leaders, and still half a second slower than what the Williams managed at the time. On lap 22, Hamilton reported "Right now I'm in big trouble, the rears are done". Indeed, he became 7 tenths slower then Leclerc ahead, while Vettel managed to close up. A big part of that is due to Hamilton's soft tyres, but a couple of mistakes that saw him run wide didn't help either. The same lap, Hamilton got passed by Vettel. Around lap 33, another series of pitstops started, with Verstappen the first one, taking on another set of mediums, just like Hulkenberg. This promoted Norris into 5th until he stopped to switch back to softs again, rejoining in 9th. Hamilton pitted at the same time to take on mediums, just like Vettel one lap later. As the latter came back out on track, Hamilton was just half a second behind. Leclerc was pitted on lap 36 and returned 3s ahead of Bottas until the Finn pitted another lap later. At about the same time, Hamilton made another attempt to get past Vettel round the outside of Turn 3, and made the move stick, following which Vettel spun, without touching the Mercedes. The German quickly informed the team he wanted to pit, and when 3 corners later, his front wing fell off, that was a certainty. The German changed to softs and went out again in 9th. Meanwhile, both Renaults were fighting each other hard, with Hulkenberg at one point running over the front wing endplate of Ricciardo's R.S.19. Immediately after that event, Vettel worked his was past one of them to keep them apart for a few laps, until the Ferrari got ahead of Hulkenberg as well. The damage on Ricciardo's car though meant he lost some pace, and made him vulnerable to attacks from behind, as Norris and Raikkonen were within striking distance. In the next two laps, Ricciardo fought hard, but still lost both positions. At the same time, Leclerc reported engine issues, increasing his laptime by around a second. On lap 46, this brought Hamilton within 4 seconds. The problems worsened, and a 1m39.7 the next lap saw Hamilton close in to 1s. And just when they arrived on the main straight, Hamilton easily got ahead of the Ferrari to take the lead. Leclerc continued with 1m40s, losing 5s a lap to the rest of the top 5 runners. On lap 53, Bottas took second as Verstappen rapidly closed in as well. 3 laps from the end, both Renault's stopped out on track with engine trouble. The event brought a safety car on track, triggering Sainz to retire from a disappointing race as well. The safety car in fact saved Leclerc's podium finish, as without it, Verstappen would have made the pass for third, without doubt. Some solace at least for the Monegasque who did an impeccable race.